Welcome Springtime – Let’s Relax Alfresco At Last! We welcome springtime by the clock change which gives us longer lighter evenings. It is the wake up call to get back outside in our gardens. Some of us think that food tastes so much better when cooked and enjoyed outside. So now is the time to get a stylish garden dining set and we can help you choose. The price is right as we currently have our bumper Spring Sale. We can offer you a choice of 4, 6 or 8 seater outdoor dining sets to suit your entertaining needs. So don’t hesitate. Come and have a look today and start planning your first Spring BBQ gathering. 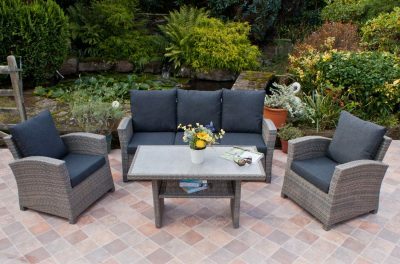 Or you may prefer to chill and relax in your garden with a fabulous corner lounge set. 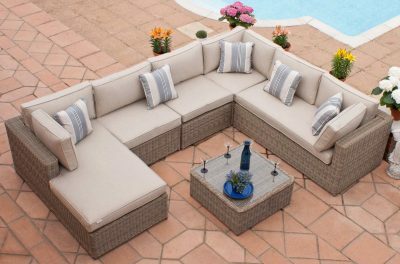 Have a look at our wide choice of outdoor sofa sets and sink into affordable comfort. Traditional 2 and 3 seater sofas for you to relax in the garden and take in the view. You will not be able to resist our super luxury reclining armchairs – so go on treat yourself and enjoy the indulgence. With maintenance free rattan frames and shower proof cushions you will wonder why you haven’t snapped one of our sets up sooner! Plus all our Casamoré Outdoor Furniture comes with a 3 years guarantee allowing you to buy with confidence. We have a great choice in colour and design so you can be certain that we have the right set for you. All our prices are extremely competitive and, with our bumper Spring Sale currently running, now is a great time to buy! So step in the world of luxury garden furniture at modest prices.